All tools & materials are included. Ties 17 of today's hottest fly patterns. The Wapsi Deluxe Fly Tying Starter Kit is an expanded version of our popular Starter Kit. The kit includes all the tools and materials to tie 17 of today’s best fly patterns. 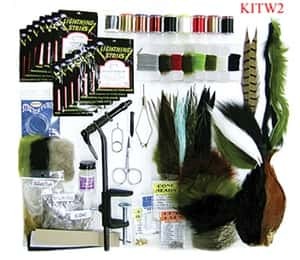 The kit comes with your choice of the Wapsi Fly Tying Handbook which offers excellent color photos detailing each fly tying step and fundamental technique.